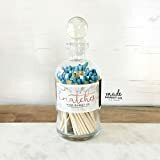 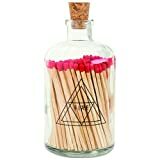 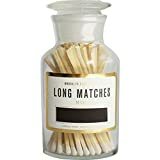 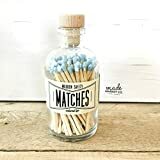 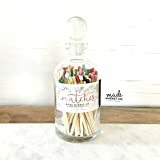 When you need to grab an old-fashioned wooden matchstick to produce a fire in the modern age, forget digging through some clutter-filled junk drawer in your kitchen and reach for this cool new Apothecary Match Bottle that you can proudly put on decorative display. 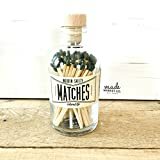 Unlike the typical flimsy cardboard match box, this unique glass apothecary-styled bottle holds up to 120 four inch long wooden matches, has a striking flint on the side, and stays sealed tight with a cork on the top. 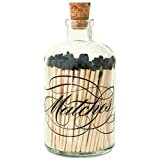 It even adds a little inspirational poetry to your life with the phrase, "It's better to light a candle than to curse the darkness" silk-screened onto the side. 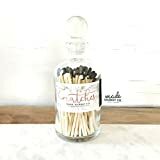 Inspiring phrase "It's better to light a candle than to curse the darkness"